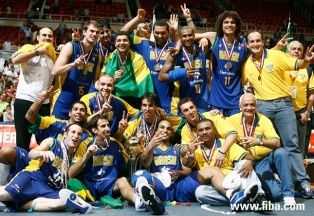 SAN JUAN (2009 FIBA Americas Championship) - Brazil won the Gold medal at the FIBA Americas Championship by winning over Puerto Rico 61-60 in the final game of the tournament. Leandro Barbosa scored 24 points and Tiago Splitter 13 points with 9 rebounds for the winners who held a fourth quarter comeback by the hosts fueled by their bench. After a fatal first three quarters, Puerto Rico took their reserve players out and began a comeback. Filiberto Rivera, Guillermo Diaz, Angel Daniel Vassallo, Ricky Sanchez and Danny Santiago led Puerto Rico back into the game with great defense and a more aggressive attack on offense. An alley-oop done between Filiberto Rivera and Guillermo Diaz sparked the Puerto Ricans and later, with 2:34 left Daniel Santiago made a basket to be down 59-57. Tiago Splitter made two free throws and Arroyo placed the Puerto Ricans back down by two again. Vassallo made only one free throw with 32.8 seconds left to be down by one and after a miss by Tiago Splitter, Carlos Arroyo had the opportunity to win the game but missed a three pointer as time ended. Brazil had a great start, with a balanced offensive attack led by guards Marcelo Huertas and Leandro Barbosa. The first quarter ended 19-13 for Brazil as Huertas had 5 points, Barbosa, Varejao and Alex Garcia 4 points each. Carmelo Lee led Puerto Rico with 5 points and Carlos Arroyo netted 4. In the second quarter Barbosa continued with his great performance followed by Varejao as the first 20 minutes ended 36-28 for Brazil. Barbosa had 14 points and Alex Garcia 9 at the half. Brazil shot 48% from the field while Puerto Rico had 35% (12-34). Filiberto Rivera as time ended. In the final quarter the fans and the bench players gave Puerto Rico a chance with a great defensive effort and a lot of heart, but fell short in front of their fans. Carlos Arroyo was the only Puerto Rican in double figures with 14 points and 3 assists in 27 minutes.